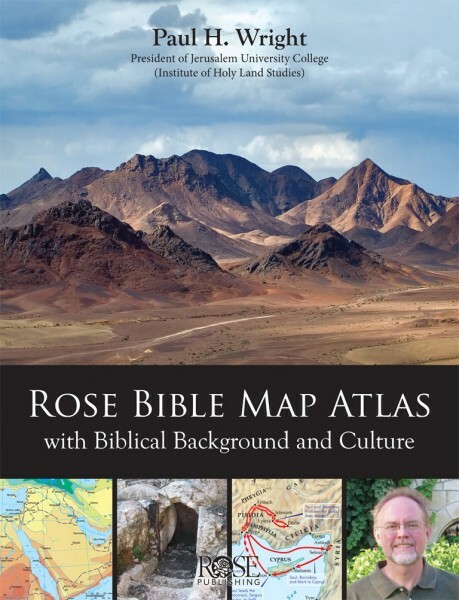 With more than 120 full-color maps, plus more than 50 photos and diagrams and family trees, the Rose Bible Map Atlas not only has beautiful and accurate maps of locations in the Bible: it explains why these locations were so important. Understanding the geography and culture make the stories of Abraham, Moses, and David come alive. Paul Wright's text give Bible references and shows how knowing the Land of the Bible uncovers new details about the most beloved stories and people. Know how David's clever understanding of geography and politics led to his marriage with Ahinoam of Jezreel. Discover why Naomi, in the Book of Ruth, couldn't just move back to Bethlehem after her husband's death and use his land again. Find out why Moses and the Children of Israel took the long southern trek from Egypt to the Promised Land, rather than the direct route. No one explains Bible geography and culture better than Dr. Paul H. Wright. He lives in Jerusalem and is the executive director of the Jerusalem University College (Institute of Holy Land Studies).